Bernard Theodore Hofreiter, age 94, passed away peacefully surrounded by his loved ones on Tuesday, October 2, 2018 at Proctor Place in Peoria. Bernard was born on July 22, 1924 in Peoria to Charles and Hazel (Lofton) Hofreiter. He was raised by his mother and grandmother, Catherine (Scanlan) Lofton with much help from great-Aunt Mary (Scanlan) Fahey. He graduated from St. Mark’s grade school and from Peoria High School, class of 1942. While a student, he worked for Ray Barclays at the Barkley Commercial Photo Company where he learned the basics in photography, a lifetime hobby. He was called to service from the Army Air Corps Reserve in 1943. He was trained in photography and the analysis of aerial photographs. He served with the 27th Photo Reconnaissance Squadron at the Mount Farm airfield in Oxfordshire, England. An exceptional coincidence occurred when he was on a leave in Oxford and asked for directions from a local. The local turned out to be Dr. G.N. Heatly, one of the two English scientists who brought the original strain of penicillin to Peoria Ag Lab in 1941. In the winter of 1944-45, the 27th operated from a former Luftwaffe airstrip in France near the Belgian border. Following his discharge, Bernard attended Bradley University under the GI Bill receiving his BS and MS degrees in chemistry under mentor Dr. John H. Shroyer. He married Mary Ann Snyder on July 12, 1947. He was recalled to service during the Korean War and served 14 months in the chemistry laboratory of the Percy Jones Army Hospital, Battle Creek, Michigan. In 1969, he returned to graduate school at North Carolina State University earning a Ph.D. He was a research chemist at the Northern Regional Laboratory in Peoria for 28 years investigating the basic chemistry and commercial applications of cereal products. He had 76 peer-reviewed publications in scientific journals and 3 U.S. Patents. 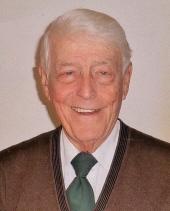 After retiring from the Ag Lab, Bernard was an assistant professor of chemistry, for one year, at Illinois Wesleyan University, Bloomington. Subsequently, he spent two years on a grant sponsored by the Illinois Heart Association at the Peoria College of Medicine, University of Illinois. There he developed an improved procedure for determining the concentration of the stress-hormone cortisol in blood which he described in two publications. Following this, he and Mary Ann volunteered with the International Executive Service Corps to consult with developing chemical companies in the Far East. They spent a total of seven months in South Korea and Sri Lanka. Thereafter until totally at age 80, Bernard was an adjunct professor at Bradley University. In 2004, he was named Distinguished Alumnus of the College of Liberal Arts and Science, Bradley University. He was very appreciative to have participated in the Land of Lincoln Honor Flight in 2013. Bernard and Mary Ann traveled many miles visiting family and lifelong friends in America, England and France. One trip of four months duration went from Peoria to New York, Rome, Bangkok, Sri Lanka, Hong Kong, South Korea, Minneapolis, and back to Peoria – Around the world! He was an emeritus member of the American Chemical Society. Surviving are his children, Philip (Holly) Hofreiter, Ann (Theodore) Hart and Janet (Ron) Aldrich; eight grandchildren and eight great-grandchildren. He thoroughly enjoyed and appreciated his life-long friendship with Gladys Fritz. Bernard was preceded in death by his wife, Mary Ann and one son, William. In his honor, memorial contributions can be made to the South Side Mission or Peoria Area Food Bank. The family is grateful for the compassionate, loving care from all the staff at Proctor Place as well as Mae Roberts, Methodist Hospice. A memorial service celebrating Bernard’s life will be held at Proctor Place, 2724 W. Reservoir Blvd., Peoria, IL on Saturday, October 20, 2018 at 1pm. Arrangements were handled through The Wilton Mortuary. "Email Address" would like to share the life celebration of Bernard T. Hofreiter. Click on the "link" to go to share a favorite memory or leave a condolence message for the family.